I grew up in the forest. I was a feral child. Alone, but connected to the earth in some ways I didn’t understand. So the forest became a haven, a parent and a teacher. That was the way it was, until I fell in love. I fell in love twice at the age of twelve. The first was to a girl in my class named Birdie. Short for Roberta. She was an enchanting stork-like being with a beautiful smile. All of the boys in class loved her, yet she appeared to only like one of my classmates. So I was stuck in the adolescent paradigm of unrequited love. Not quite sure how to earn her attention, I spent a lot of time in the forest. It was there I met my other paramour. That love has been with me all my life. I first noticed this creature in winter while I was sitting under a balsam tree during a snow storm. A flash of black and gray with a mercurial way of flying… the Black Capped Chickadee. Soon joined by three others, they examined me in a way that Birdie never did, belying an intelligence greater than the sum of their small brains. Then they discussed me. It wasn’t love at first sight, but it was the beginning of a relationship. It provided some distraction from my self-imposed pain and over time it helped me understand the forest was not a single thing, but a network of things that possessed its own intelligence. Chickadees are social birds that live in flocks. As a kid, I could see that they had relationships with other birds. They particularly liked their cousins, the nuthatches, though by comparison they seemed a little dim-witted. They used the Downey’s and the Hairy’s abandoned holes in which to make nests. They had a collective intelligence that allowed them to share knowledge. If one bird figured out how to get a seed from a pine cone easier than the accepted method, or escaped the attack of an owl by diving into a particular bush, it was able to transfer that knowledge to others. So they had a system of collective learning that allowed knowledge to be passed from one generation to another. It was the same in their quest for food. Eating insects in the summer and early fall, their diet switched to seeds later on in fall and winter. Their favorite was the balsam seed. When I hike now, I carry a magnifying glass and a small twenty power microscope. So much of what powers the world appears in the microcosm. If one looks only at the whole, it is difficult to see how the parts fit together. But at the smallest level, all life is looking for a few amino acids. The balsam takes energy from the sun and its macrobiotic root system converts the nutrients in the soil to energy in the form of branches, needles and seeds. The seed is a high concentration of proteins. But the balsam too is a network of signals and chemistry. I have asked the question, does the forest talk to the clouds when it is thirsty? Under a microscope, the needles of the balsam, have two parallel silver lines on the back of each. Along these are a series of perfectly round holes. These holes are formed by two cells and are responsible for plant respiration. But what do they respire? Certainly they take in carbon dioxide and emit oxygen. But in a primitive fashion, they too speak a language. They also take in the chemistry of insects and sunlight and moisture. They may also send out signals in the form of chemistry to others. As a child, in summer, I believed I could differentiate between the smell of crushed cedar, Norway, jack pine and balsam. On a good day, maybe tell the difference between the double needled and a single needled variety. What was I smelling? What was the tree telling me? The blue haze above a pine forest (i.e. Blue Ridge Mountains) is caused by trees emitting terpenes. But I learned that nature does not create without purpose. These terpenes can be nucleating sites for rain. 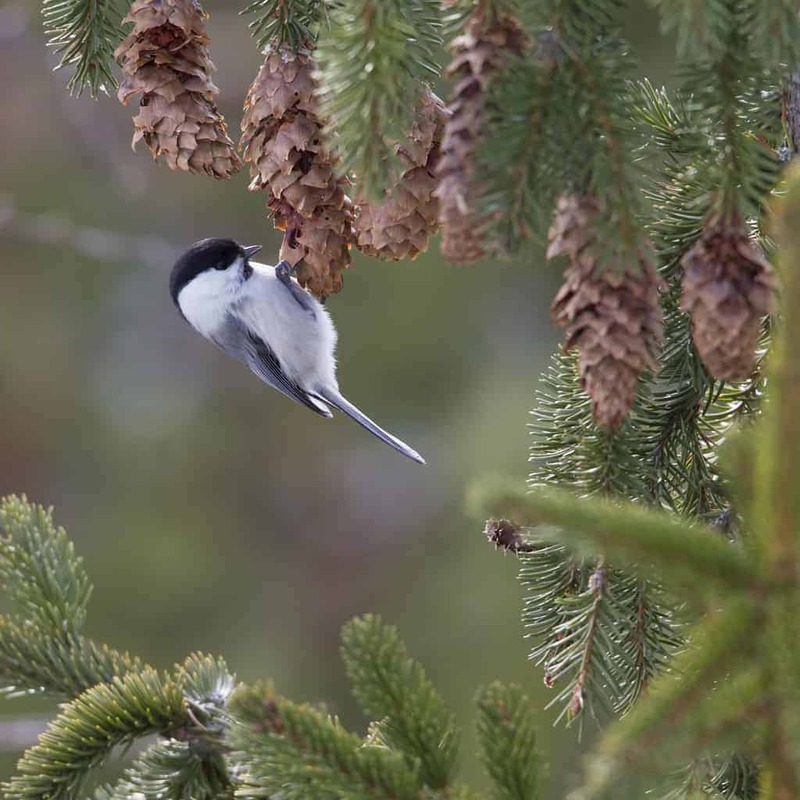 When it comes to Chickadees they may perform another function. Balsam cones are protected by resin for most of the summer. But as the tree senses a change in it’s environment, the resin hardens and then begins to drop away. It is then that the balsam calls to the chickadee. It says, come and get it. Using its phonetic vocabulary, the chickadee in turn, calls its flock-mates and, in a symbiotic relationship, they chip away at the cones. The chickadee get’s nutrition, but a few seeds are sprinkled to the wind thus assuring the possibility of survival for the balsam. But the chickadee also does one other thing. It stores the seeds for winter in the cracks of old logs and moss. In the fall the brain of the chickadee expands in order to remember the location of these seed placements for survival through the winter. These locations are ideal for the growth of seeds. But to the balsam’s advantage, the chickadee sometimes forgets. So now I ask, does the chickadee remember which balsams offer the best seeds? Does it tell others? Does the tree remember particular birds? It doesn’t have the nervous system of an animal, but perhaps it breathes a particular scent that attracts these little intelligent birds. There are those that say that all this is too much. Trees can’t talk to birds. This is nonsense. But I wonder. 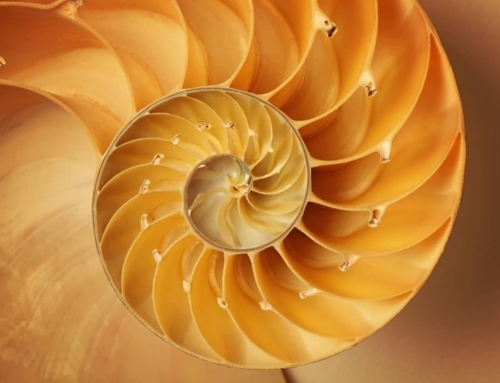 Nature is more complex than we can imagine. While we must try, we don’t understand everything. What was it that attracted me to Birdie? We exist at a unique junction between insufficient knowledge and wonder. We are simply part of the forest. When we think we think we understand everything, we lose our place in the forest. In our certainty that we control nature and have dominion over the earth, “harvesting” thousand-year-old trees becomes an act of arrogance. Destroying the forest becomes a form of suicide. If not, one might as well try to explain love.